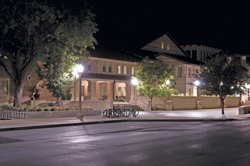 Energy Saving LED retrofit for Southwestern University Campus, Georgetown, TX. We’re going to help companies by providing them with an easy way to make an environmentally sustainable choice. ActiveLED, a Texas-based manufacturer of USA-made ActiveLED luminaires, announced today the launch of their ActiveLED Recycling Program. Designed to last, it may be 15-18 years before an ActiveLED Lighting Fixture reaches its end-of-life, but once it does, this program allows owners of any ActiveLED manufactured product the choice of shipping it back to ActiveLED for recycling. ActiveLED, Inc., a division of Ringdale Industries, Inc., is an innovator of solid-state technology and manufacturer of commercial and industrial LED lighting fixtures. ActiveLED is at the forefront of LED lighting technology and has revolutionized the standards of LED lighting to deliver better, cooler, longer-lasting lights that use a fraction of the Watts compared to other fixtures. Founded in 2007, ActiveLED is headquartered in Georgetown, Texas, with offices in the United States, the United Kingdom, Japan, and Singapore.